The election season is already taking up much of the oxygen in our culture and in our classrooms. Politics is pervasive, and even if we as individuals are not particularly interested in the latest campaign news, the presidential election has a way of confronting us in our daily lives. Politics has the potential to be ennobling, to cultivate character and understanding, but one would be forgiven for doubting that potential today. Politics – similar to religion, interestingly – is often viewed as something to be avoided. I hear well-meaning friends say, “Let’s just get through this election.” Perhaps you even feel that way. I care deeply for Christian college students. Those years may not always feel tender to the students themselves, but they are. No other time in a person’s life combines such high levels of both impressionability and individual agency. And there is perhaps no more pivotal stage for a Christian – as far as these things can be generalized – than that twin junction where you try to figure out both who you are and what you want to do with your life. In the independence of their college years, Christians develop routines that can be difficult to break later in adulthood. This is the context I keep in mind when I speak to and work with Christian college students on political issues. What lessons are they learning about what Jesus means for their lives as we work through discrete political topics? When the topic of politics and Christian college students arises, one story immediately comes to mind. During my time working at the White House, I worked with a Christian student leadership program to host its students for a briefing with administration officials. The program brought together Christian students, primarily from Christian colleges, to hear from top policy makers, advocacy groups and religious leaders. I was particularly nervous about one of our speakers. Kal Penn served as an associate director at the White House Office of Public Engagement for youth outreach. He’s a great guy: a generous disposition, bright as all get out, and a passionate advocate for young people and their interests. Kal is also an actor, famous for his comedy movies about the antics of two friends, Harold and Kumar. The humor in his movies could get quite bawdy. I was thrilled to have Kal speak to the group, but I also was not sure it was a great fit. Was this Kal’s first time speaking to a group of evangelicals? Did he know what he was getting himself into? I briefed Kal as well as I could, noting that while the students in the room would likely disagree with the president and many of their fellow college students on some key issues, they were also deeply passionate about issues like global poverty, human trafficking and student loan debt (which transcends all religious and ideological boundaries). It can be difficult to assume what Christian students are thinking about politics. Many have learned the wrong lesson from the perceived mistakes of their parents’ brand of politics and have determined it is best to keep their faith and their politics separate. What does it mean to think Christianly about politics, and how do we support Christian college students as they do so? We must first set politics in its proper place. Most fundamentally, this means rejecting the idea that politics and political outcomes have the final say. Christians should be less susceptible to political strategies based on stoking fear and anxiety, because our peace and security do not come from a political arrangement. Insist that faith is of great value to our political discourse because it is a reflection of reality. As Christians, we can bring who we are and what we believe to our politics just like everyone else. How we do this in politics will be different from how we live out our faith at work, or at church, or in our familial context, and that is OK. God is not confused by our political system. We do not need to leave our faith at the door when it comes to political matters; Jesus is just as relevant to our politics as he is to any other area of life. He is renewing all things. Teach students that, grounded in confidence, we can engage ideas and people without fear or anxiety, in the pursuit of what is true and what will lead to true flourishing. As Christian college faculty and staff, you can model this confident engagement and create opportunities for your students to see a faith that is not subservient to any earthly political ideology. Are your students able to critique their favored candidate? Are your students able to describe what they like about the candidate they ultimately oppose? In a political and media environment that seeks to put itself in the place of bestowing affirmation and casting shame, and “news” sites that promote isolation through judgment-filled and ideologically limited reporting and commentary, Christians should be able to travel between these silos as people who find their identity in Christ. Encourage students to make political commitments and take political action. We have the highest number of political independents in this country we have ever had in the modern political era. Over 41 percent of Americans, and over 50 percent of American Millennials, are independents. In a two-party system of government, this means that a majority of Millennials has effectively checked out of the system, depriving political parties of their input and influence. It is a good thing if your students do not agree completely with either political party; our political parties need members who think they’re wrong on some issues. However, joining a political party is one way your students can say, “I’m in,” when it comes to their political responsibilities. 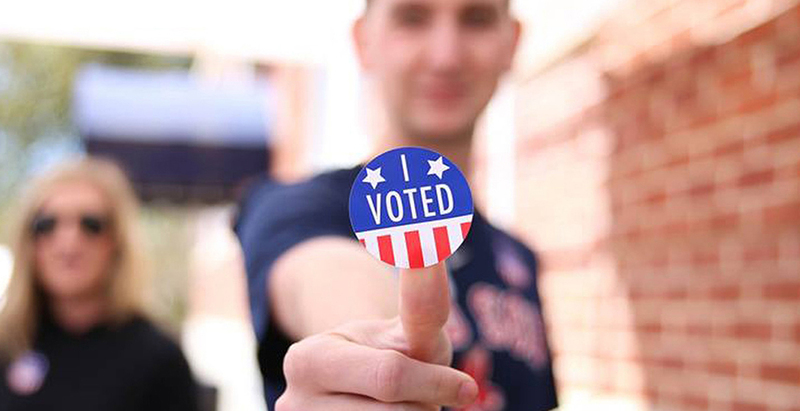 Although we do not engage in politics simply to win – to achieve our preferred political outcome – students should also understand that their actions have the potential to impact the presidential election. Your students might be surprised that a letter to a candidate or in the newspaper can affect internal decision-making at a campaign. If they want to be directly involved in supporting a candidate, they can drop by the local party headquarters or a campaign field office and volunteer. Students can also take responsibility for their community and their campus by organizing opportunities for political education and discourse. What events could be held on campus to bring attention to an under-appreciated set of issues? What forums could be provided for earnest students who want to use their vote well to learn from one another? If Christian students are going to think Christianly about politics, they must learn how to interact with the ideas and perspectives of those who deeply disagree with their views. Some of this education is inherent to the college experience: Christian colleges provide a diverse environment where students can test out their ideas. This is increasingly valuable, since people are now less likely to interact with others who hold different ideological perspectives because of the proliferation of specialized media outlets and the way we organize our lives. The testing that a Christian college can provide to students’ political views can both sharpen what those students are most confident in and provide humility and nuance to their perspectives. We need both in our politics today. College faculty and administrators should be proactive in presenting various political views to their students, so that students are not surprised to bump into them when they leave college. Many Christian colleges are already doing this well – for instance, Biola University in La Mirada, California, recently hosted conservative legal scholar and progressive intellectual Dr. Cornel West for a joint dialogue on campus, and Wheaton College in Wheaton, Illinois, held an event with former Democratic Congressman Tony Hall and former Republican Congressman Frank Wolf. These kinds of opportunities can be formative for students trying to figure out how their faith ought to influence their politics. As I talk with Christian college students across the country, I encourage them to think about the passions and sensitivities they feel God has given them and to allow those to shape their political action. Politics is incredibly complex; there are no perfect options. This is confounding to many Americans, particularly young people, who have been made to believe that every choice they make is a totalizing statement of their identity. But we do not locate our identity in politics. The goal for Christian colleges in helping their students consider this presidential election is the same as it is in other areas: leading students into an integrated life where their faith in Jesus guides and infuses all that they do. When we succeed in that, the possibilities are endless. The 21st century American political and cultural landscape is going to look vastly different from what we have previously known. Our country is more diverse and less religious; polarization has seeped into the very fabric of our communities; the political incentives and opportunities to stoke conflict seem unprecedented. What will the American church do in this new season? It is at the time when Christian ideas are most contested, when truth seems most up for grabs, that Christian withdrawal is most tempting and least helpful. Our politics need integrated Christian college students, committed to the well-being of their neighbors, sent out into the world with the moral imaginations to help us find the way forward. Christian college administrations, faculty and staff have the incredible honor of partnering with God to help cultivate that kind of young person. Let us not shy away from this political moment. Let us not be anxious or fearful, but rest in God’s presence, and act in the knowledge of Christ and his work of renewal. Michael Wear is the founder of Public Square Strategies LLC, and a leading expert and strategist at the intersection of faith, politics and American public life. He served in the White House Office of Faith-based and Neighborhood Partnerships during President Obama’s first term, where he led evangelical outreach and helped manage the White House’s engagement on religious and values issues. He also directed faith outreach for President Obama’s 2012 re-election campaign.